Whether you are shopping for you favorite science nut, or yourself, the following with give ideas that have been well received in the science and weather enterprise. Feel free to send us any other suggestions! Looking for that quick and unique gift? Well you might be in luck. These Weather Themed Magnets ($12), could be that inexpensive gift that is actually memorable. Any weather nut out there would be proud to display these on the fridge or file cabinet. Everyone has a place for extra magnets, or maybe to replace those old pizza phone number magnets. 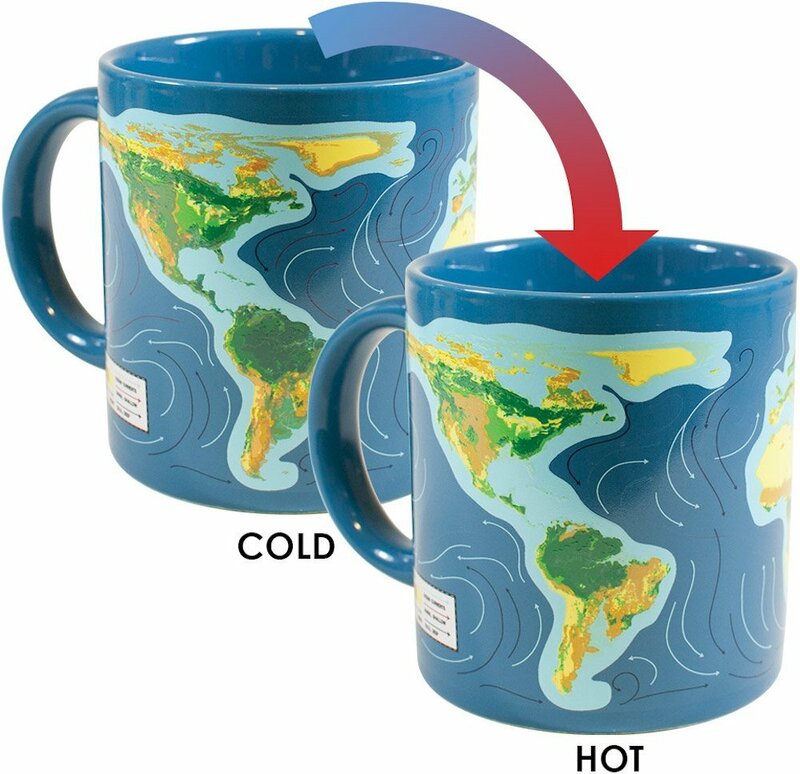 The Climate Change Mug ($16) is the perfect gift for an office exchange or for that scientist or science fan of yours. 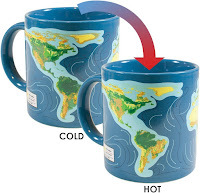 As seen on the picture to the left, the mug will change colors with warm liquids inside to signify sea level rise. Several friends have this mug, and it really works! Definately a great conversation starter at minimum, and a practical gift indeed. The $16 is well worth it, and much of the profits go to a good cause. Why not toss in the class candle gift. However, this one might come with a surprised twist. The Village Candle - Rain Scented ($20), is a new scent that brings a refreshing atmosphere to any room. It provides at least 150 continuous hours of burning (not that we tried), and will definitely be worth the money . Check out the reviews, it has been keeping pace with Yankee Candle in many circles, meaning you will get more for you money instead of overpaying for a brand name. If books are on your list, check out The Ultimate Guide to America's Weather ($20). While the name certainly describes what this literature is all about, the AMS weather book is becoming a go to for gift ideas in the weather enterprise. With great reviews, and best seller counts, this gift should not disappoint, assuming they enjoy reading. The book will dive into the various weather across the country. The United State is a rare country that can see close to any weather Mother Nature has to offer. Its oceans, gulfs, lakes and mountains lend its hand in creating some of the more extreme weather this planet has to offer. The La Crosse Forecast/Weather Station ($34) is great for anyone who needs to dress for the outdoors. One of its kind, in that is includes an outdoor temperature/humidity sensor and also gives the forecast for the day. Connecting through Wi-Fi, this weather stations pulls in data from the National Weather Service to display a quick and easy High/Low temperature forecast along with chance for precipitation. I currently have one at home, and love it. The temperature indoor and outdoor is very accurate. Such a great deal! Going one step above the thermometer and forecast station, La Crosse also offers a state of the art Personal Weather Station (~$100). It comes equipt with all the prior mentioned features, but now includes a person anemometer to measure the winds, along with a automated rain gage. It's the weather station that will make any weather geek happy. Data can be recorded and synced with the phone through the La Crosse mobile application. It is definitely worth the extra money for the science nut out there. And check this out! A conversation starter at worst, this Vortex Water Fountain ($149) will bring certain intrigue to the neighborhood. Here is a link to watch this guy in action, Youtube Video. It is on the pricey side, but there is certainly a lot less you could buy for a lot more. Maybe you are a teacher that can chop this up as classroom learning material. Maybe you want to add some science to the backyard 'near-botanical garden'. In either case, it will not take much to convince yourself in gifting this item to a loved one, or to treat yourself.